We know that there can be a lot of loose items stored in large bins in a factory or warehouse environment. It’s important to make sure you have the right tools available to your staff in order to help manage this load and ensure your place of business is running efficiently. 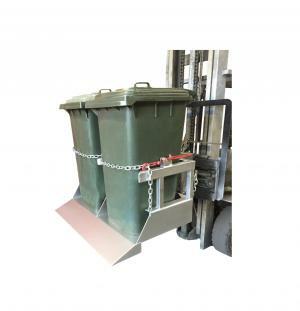 Our range of bin tipping mechanisms that attach to your existing forklifts are the perfect tool for this task. 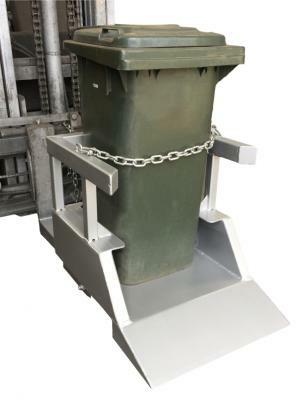 Secure the tips to any bin to move them around the warehouse and empty as required, all completely achievable by the forklift driver while still in his seat. The perfect tool to help with stocktake and an assortment of other daily warehouse tasks, including the disposal of waste products such as cardboard to a compactor. If you have any questions or would like a demonstration, get in touch with our expert team today. DHE Materials Handling Equipment offer a variety of forklift attachments and equipment, including forklift slippers, spreaders and cages to suit all types of warehouses and factories. As a leading supplier to some of the biggest names in the manufacturing, mining and chemical industries in Victoria, we know our products must adhere to the highest quality standards, as well as the strictest safety regulations set out by the Australian Government. This ensures everyone comes to work knowing they are in good hands and will be able to complete their jobs efficiently and safely. We provide you with the right tools for any job at competitive prices. If you have any questions regarding our high-quality products and tools, we encourage you to get in touch with our friendly team. You can reach us over the phone by calling 1300 067 281 or by sending an email to inquiries@dhemhe.com.au. We’ll endeavour to get back to you as soon as possible with all the answers you require. Alternatively, if you prefer you can visit us in store to view our products in action and find what’s right for you. Visit us today for an obligation-free consult.